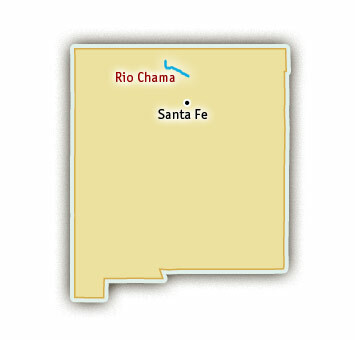 In the northern New Mexico, about 75 miles northwest of Santa Fe, the Rio Chama, a tributary to the Rio Grande, meanders its way through a stunning sandstone canyon. Pastel canyon walls that are a rainbow of orange, yellow, and rose are lined with ponderosa pines and cottonwood trees. Many of Georgia O’Keefe’s paintings are inspired by the enchanting Rio Chama region, which she called home. Rafting.com is currently seeking qualified outfitters for Featured Listings. If you are a local rafting outfitter in New Mexico and would like to see your company listed here, please contact us for more information. Rio Chama rafting trips are relaxing and peaceful, but they have some fun whitewater to spice things up. An overnight rafting trip on the Rio Chama is an absolute treat. The Rio Chama is more famous for its tranquil beauty than for its whitewater, however, the Class II rapids add excitement to the river trip. Rio Chama rafting trips are one, two or three days long and float up to 31 miles through one of the most spectacular desert river canyons in New Mexico. There is plenty of time on Rio Chama rafting trips to go on side hikes, fish, and relax in the canyon. Trips run from April to September and are great for rafters of all ages.